A leaflet compiled by members of the Solidarity Federation to share with workers in struggle - making the case for workers' self-organisation with practical examples from recent disputes. Download a print-ready pdf here. Recent years have seen promising signs of a working class fightback, after decades of attacks on working class living standards. Postal workers went on national strike in July 2007 over 40,000 threatened job cuts and attacks on pay and pensions. The strikes got off to a good start in July, rolling strikes and a work to rule caused a massive backlog, then later sparking wildcat strikes across Scotland and the North of England. 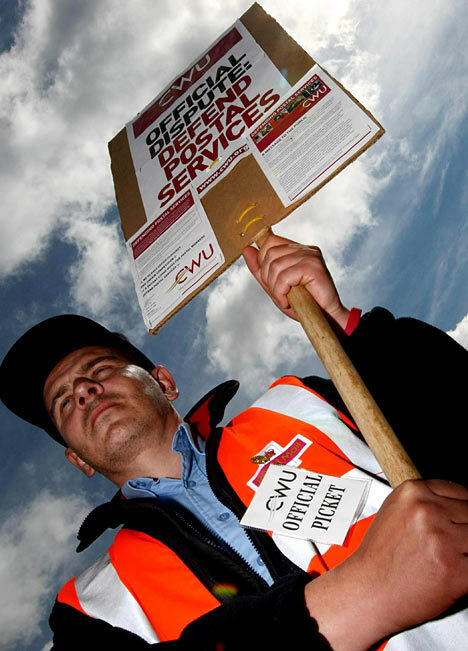 As the second wave of official strikes was due to start, they were called off by the Communication Workers Union (CWU) leadership, entering 'meaningful negotiations' with Royal Mail management. These 'meaningful negotiations' lasted for weeks, came to no firm conclusion (except that measures would be forced through at a local level where it's easier to divide the workforce), and prepared the stage for a fresh assault on pensions the following year. Striking posties in Liverpool who had continued with unofficial action were left out on a limb - spending many days without pay as the CWU refused to release details of deals done for fear of a massive negative reaction from elsewhere - with the workforce in most places demobilised by a slow and agonising wait. "This deal is a total stitch up. During the strike we had them by the balls, then all of a sudden this little agreement was reached. We could have won so much more, given the amount of support we had throughout the country." With cost-of-living inflation running at between 5% and 10% and the government seeking to impose a 2% pay ceiling, 2008 saw workers across the public sector balloting for strike action. Despite much talk of common, unified action, workers organised in different unions were divided up into lots of separate, easily defeated units and taken on one by one. In some areas, where workers weren't so organised, workers were encouraged to accept pay cuts by the unions, like UNISON in the health service. After that, the next biggest group of workers in local government were demobilised with the union clearly attempting to scare people off taking action. When UNISON eventually realised that they would have to call a strike to save face in the eyes of their angry members, they organised just one stoppage, of two days, with no dates for future action set. After initial actions, workers were left for months while "talks" went on behind closed doors between the unions and the employers, with no pressure actually being exerted on the employers by dates for future walkouts. By the time that the employers inevitably refused to improve their offer, workers had been demoralised by months of inaction. School workers, who amongst the lowest paid council staff were on their holiday during the union consultation. Apart from those, some of the larger, more militant sectors such as teachers and the civil service were left completely isolated, and the government largely succeeded in imposing across the board pay-cuts. It’s noteworthy that the workers who did manage to win decent pay rises – such as the Shell truckers, who won 14% over two years – were those willing to take militant, sustained direct action and spread the struggle beyond their immediate workplaces. In March 2009 Visteon - a company making parts for and majority owned by the Ford Motor Company - announced the closure of three factories in the UK and the sacking of 610 workers without redundancy pay. Workers were given only minutes notice of the decision. This triggered workers at the Belfast factory to occupy their plant, demanding proper compensation. Their action was emulated the next day by workers at the other two UK plants, in Enfield and Basildon. The workers held the plants – and held the power, preventing administrators from selling off the company assets. Workers at all plants were members of the Unite union. From the start at Enfield, Unite's only contact point and involvement was via the factory's convenors. Some union bosses came down briefly to pledge support, but actually delivered nothing, apart from poor legal advice – telling the workers what they were doing was illegal (it wasn’t). The occupiers were left to sustain themselves - despite workers paying years of union subs, no money was given (after 3 weeks or so, it is rumoured that the union finally provided a little finance). The union gave no mention on its website of the dispute, nor encouraged their members to give active support. Eventually, an offer was negotiated by union and company bosses - behind closed doors. The first offer was simply the legal minimum. The threat of solidarity strikes brought bosses back to the table with a slightly improved offer. Prior to voting, Enfield workers had the details of the deal read out to them by convenors, and some saw a handwritten version of its points – but workers were not provided with copies of the agreement they were supposed to be deciding on. The vote on the deal was deliberately arranged by the union so that Enfield and Basildon voted on it on the Friday, then Belfast, still in occupation and with a more militant reputation, would vote on the Sunday. So, inevitably, the acceptance of the deal at Enfield and Basildon was designed to encourage acceptance at the Belfast vote. All plants did vote acceptance; the Enfield vote was 178 to 5 and Basildon was 159 to 0. Belfast voted 147 to 34. While the workers won small concessions, Unite’s role throughout was to urge an end to the occupations – the very source of the workers’ bargaining power – since they were organised and controlled by the workers themselves. Once Unite regained control, they recommended acceptance of a partial offer that left the crucial issue of pensions untouched. The examples in this leaflet show the contradictions and limits of a rank-and-file level of trade unionism. It is not simply a matter of the unions ‘not doing their job properly’ – they do it only too well, since they need to be able to control workers’ struggles in order to function as representatives of those struggles. Shop steward and convenor positions - often taken by the most militant workers - must mediate between shop floor interests and the union bureaucracy's organisational interests. Workers often see the union as an organisational framework giving them a collective identity and protective strength; and on a day to day level it often does so, within existing conditions and agreements. What workers don't always acknowledge (or fail to act upon) is that this strength is their own power mediated – and therefore limited – by the union structure as its representation; a power that has the potential to conflict with and go beyond both the control of their employers and their union leaders. In place of the representation of workers in the trade unions, what is needed is self-organisation by workers exercising their collective power directly. How can this be done? Fortunately, many millions of workers have faced these problems before, and out of their trial and error some forms of organisation have repeatedly proved the most successful. The central form of self-organisation is the mass meeting. However, it is vital that mass meetings do not just give a democratic rubber-stamp to decisions made elsewhere (as happened in the Ford-Visteon dispute), but take an active role in organising and controlling the struggle. Workers should demand whatever information they need to make informed decisions from management or union officials, and develop a culture of discussion to ensure all workers, even those with less experience or confidence can play an active part in the struggle. Many workplaces have several recognised unions. Workers should open up their meetings to members of other unions as well as non-union workers – who should not be assumed to be scabs since they have the same interests as their workmates. Management and scabs should be excluded from workers’ mass meetings, but workers should consider letting supporters attend without voting rights at their discretion. Not everything can be done in a mass meeting. Sometimes a strike committee is needed to draw up demands. Other times workers may want to produce a leaflet or do some research. They may also want to send delegations to other workplaces in order to encourage solidarity actions and spread the struggle. These kind of things cannot practically be done by mass meetings of tens or hundreds of workers; delegation is needed. The important thing when electing delegates is that the mass meeting retains overall control. Even members of the strike committee are not there to lead the rest of the strikers, but to implement their will. This means delegates should be mandated, given a specifically defined task or tasks to carry out. Delegates can then be recalled and replaced by the mass meetings if they fail to carry out or overstep their mandates. In the heat of a dispute many a solid shop steward or convenor has been forced to choose between the interests of their workmates and those of their union bosses. This highlights the need for militant workers to organise independently of the trade unions as well as inside them. Such networks of militants can help provide the moral support to do the right thing, as well as advice, practical support and a continuity of experience between the ebb and flow of struggles. They can also link militants in different workplaces, industries and places, creating the potential to spread struggles that terrifies bosses and wins disputes. Such networks are not there to represent workers, but should agitate and organise for self-organisation: mass meetings and the use of delegates. However as they grow, such networks can take on some of the useful functions of trade unions (such as legal advice, co-ordination with other workplaces etc) without the problems of representation (a bureaucracy that needs to control workers struggles in order to persuade bosses they are ‘responsible’ negotiating partners). Current examples of networks of militants in the UK are the National Shop Stewards Network (www.shopstewards.net), made up of elected workplace reps from all unions, and the Solidarity Federation (www.solfed.org.uk), made up of workers committed to the principles of solidarity, direct action, self-organisation and a world without bosses! The ideas set out in this leaflet are known as ‘anarcho-syndicalism’ – a practice of militant workers organising that goes beyond both the institutional and legal limits of trade unionism. See www.brightonsolfed.org.uk or email brightonsolfed [AT] googlemail.com for more information, other leaflets and pamphlets or to get involved! This leaflet is all about workers learning from others’ struggles, and organising themselves without relying on anyone else – whether union leaders or politicians. Workers are at their strongest when they take collective direct action to assert their needs against the bosses, acting in solidarity with one another and favouring self-organisation over representation by trade union officials. These principles both get results, whether applied to strikes, pickets, work-to-rules, occupations, go-slows or any of the other varied kinds of direct action available to workers in struggle. 1. Based on Pay: what went wrong in 2007? This looks like a great article. However, I think one significant omission is in the Visteon dispute: what actually got the bosses to come back to the table and come up with an offer was when the occupation was about to send large pickets to Ford plants to try to picket out Ford workers. Thus demonstrating that again spreading the struggle is the key to winning the dispute. Also, I think a brief mention of Lindsay could have been made, as an example of another successful struggle which won on the basis of having mass meetings, and again, spreading the struggle. Also, the bold words at the end of the text (strikes, occupations, etc) we could direct to libcom's tags on those topics - what you think? yeah, it's mostly compiled from previous Tea Breaks, your interview with Freedom on the public sector disputes last year and Ret's analysis of Visteon. yes this is important, but we had to be brutal - it's already 8 A5 pages long. we'll discuss any feedback though of course, and possibly revise it. we do say "The threat of solidarity strikes brought bosses back to the table with a slightly improved offer" and later pick it up with "[networks] can also link militants in different workplaces, industries and places, creating the potential to spread struggles that terrifies bosses and wins disputes." Nice one JoeK, good summary. Just an idea, but if youse wanted to do an extended thing (in addition to this very useful leaflet) that summarised many of the other workers and community struggles (big and small) I'm guessing we'd be happy to cover a lot of the Belfast stuff. A longer summary of recent workplace and community fightbacks would be timely, and it would be possible to include examples of significant gains and even wins (Lewisham Bridge School occupation, traffic wardens in Belfast). Like I say, just an idea. i think it's worth writing this stuff for libcom, even if there's not an obvious print outlet - at the end of the day libcom doesn't have the contributor base to be a breaking news source, outside of specific exceptions like the CPE etc, so Tea Break style analytical news is where it comes into its own. and it means it's there already if someone wants to compile a leaflet - like we did here. i'm writing a couple of things on the recent struggles atm, one for the bookfair issue of Catalyst. anything you want to write would be great, we could then compile it into a pamphlet more comprehensive than this but shorter andmore contemporary than 'Oh Sit Down'. The idea with this one is that at 8 A5 pages the printing costs can be kept down low enough to give it away liberally. for a longer pamphlet, you'd probably stick a 50p-£1 price on it on stalls etc, but give it away to workers in struggle. I'm sure Brighton SolFed would be up for doing a joint pamphlet with organise!, bringing in your analyses of the disputes you've supported - we could do something on Vestas too, which we've been quite heavily involved in. or if anyone else wanted to contribute, we could make it a libcom pamphlet and stick links to all the contributors in the back or something. Yeah I'll have a chat with the the Organise! ones later - I think a more comprehensive summary of recent struggles is timely. We've already written up a lot of the Belfats stuff on here or in the Leveller, but a more, step-back, analytical 'after-the-fact' thing would be useful. Might be possible to get interviews with individuals involved too. I'm thinking out loud here but I dare say we'd be happy to work with Brighton SolFed on a joint publication. Might be possible to get interviews with individuals involved too. good point - we could certainly do this for Vestas. a combination of interviews from participants and analysis from closely-involved supporters would be awesome. Yeah, that all sounds good. Posting stuff here as individual articles (rather than agglomerated into a pamphlet length piece) is useful for online stuff, because then it can go with the tag for the rest of the struggle/dispute, and also be more easily found via search engines. well, we'll be doing a bookfair issue of the Leveller, maybe we could time soemthing for then? yeah should be do-able, i'll take it to the next Brighton SolFed meeting (monday), but don't anticipate any problems (we're making an effort to build up a collection of good quality, current propaganda atm). the Brighton Vestas Support Group (of which we're a part) is hosting a public meeting with a Vestas occupier speaking next week too, so we can try and do an interview, or give one of the others a call. Thanks Brighton for this informative article! I've started to circulate it on this side of the pond. a) cos those who are interested in the point being made/perspective expressed in the quote would likely want to read the source article. b) It can piss off authors of unattributed quotes that lazy anarcho/lefty organisations pick'n'mix poorly digested quotes from here'n'there when they want to appear 'theoretical' but are too lazy to do the thinking themselves. (I'm not saying that's happening here, but it's good to set an example, for one's selves and others.) This has pissed off people, including me, in the past - it's been done by the same groups who've expressed populist anti-theoretical poses and sneered at more theoretical texts - then when they wanna look 'clever' they plagiarise without acknowledgement and, worse, misinterpret your points and/or associate them with views you don't agree with. It's particularly annoying when it's done by groups who have far greater resources than the individual writers (yet rarely write much of worth) and who (due to sectarianism/populist anti-intellectual posing) never review or publicise what they read and plagiarise. c) You admins are cheeky fuckers insofar as you have been pedantic about trivialities and about conforming to literary convention when it comes to formatting formalities of library and news articles - yet appear happy to ignore the most obvious of conventions and to use quotes without citation. the link to the Visteon tag at the bottom of the piece has your piece linked as the top 'key article', so an additional reference seemed superfluous. we're not doing that, you're not saying we are... we've used your analysis as it's spot on and there's no point paraphrasing for the sake of it, the link at the end takes interested readers straight to a link where your original is the 'key article'... As you're not saying we're doing the stuff that pisses you off, and it is referenced, I'm not really sure what else to say. We're certainly not antitheoretical or incapable of theorising, we simply see no reason to reinvent the wheel. do you guys still claim 10 admins? that's like us claiming Revol is still in Organise! Except that people won't know that what is quoted is a quote from that article or any others - unless they happen to read a particular article. So it's not a reference in the normal sense at all. the admins (10 people) and Brighton SolFed (8 people) are different, independent groups. Myself and jack are the only overlap. I know that. But, (at the risk of sounding precious and pedantic) IMO, the same policy of citing quotations should apply to both. I was referring, eg, to you and Steven in the past imposing the collective admin policy of proscribed words like 'proletarian' etc and I've had to explain more than once why you substituting it with 'working class' has been inappropriate. As well as insisting that citations for sources of are put at bottom rather than top of text, which is official site policy. So it seems a bit ironic to not bother citing quote sources, and not even bothering to cite them as a quote. If attribution is so unimportant then take the Sol-Fed name off the leaflet! Ret, i'm not sure what you want us to do? Put a " " at each end and attribute the views to 'a supporter', with which it was signed? I was referring, eg, to you and Steven in the past imposing the collective admin policy of proscribed words like 'proletarian' etc and I've had to explain more than once why you substituting it with 'working class' has been inappropriate. As well as insisting that citations for sources of are put at bottom rather than top of text, which is official site policy. So it seems a bit ironic to not bother citing quote sources, and not even bothering to cite them as a quote. we have a style guide for the newswire, but not the library. you can explain to us admins the nuanced differences between proletarian and working class, which i understand (if not necessarily agreeing with you entirely), but to the majority of our newswire readers 'proletarian' is obscure 19th century jargon, and thus meaningless, rendering the nuance moot. in any case, the fact libcom's newswire like every newswire worth its salt has a style guide has literally nothing to do with a local of SolFed using some of your analysis in a leaflet. i think your article is excellent, and so do the rest of the local, which is why we've used bits of it, but to be honest it just sounds like you're conflating a load of unrelated gripes (libcom's newswire styleguide, anti-theoretical muppets quoting out of context, unsatisfactory referencing...) and having a moan. sorry. If attribution is so unimportant then take the Sol-Fed name off the leaflet! tbh this is just facile, it's anti-organisational nonsense to give out leaflets with no contact details on. tbh the reference to the tag seemed the best way to do it, as it's (a) a simple enough URL to reproduce on a leaflet and (b) it prominently draws attention to the original, without trying to squeeze a superfluous 'references' section into what is an already 8-page leaflet, not a format with ample room for harvard referencing, proper bibliography etc. If you want, we can add fuller referencing into the online version? i mean as you say it's not like we've chopped it out of context or distorted the meaning. i could go away and paraphrase the lot, add a few neat turns of phrase of my own... but what would that achieve? if anything that would be dishonestly passing your analysis off as original. (honest question) are you just annoyed a group that you're not part of has used bits of your text? why not just add a footnote saying you nicked it? fwiw, some of that quoted me directly, and i'm not in SF, but i have no problem with it. No. As general principle, use a quote as a quote and directly cite the original source article. Simple and common behaviour. Otherwise it can give the impression you are using unacknowledged material to make yourselves look clever. If I quote something it's usually cos I think it's good enough to be worth sharing with readers - so I cite the source article cos I think that's similarly valuable. I would think it a bit rude (and frankly odd if written by someone I knew) not to do so. Surprising that I have to explain that. As you're not saying we're doing the stuff that pisses you off, ...i mean as you say it's not like we've chopped it out of context or distorted the meaning. i could go away and paraphrase the lot, add a few neat turns of phrase of my own... but what would that achieve? if anything that would be dishonestly passing your analysis off as original. If you really think it's "dishonest" to "pass... your analysis off as original" then you should surely cite the original article - as it's only if a leaflet reader then reads the whole original article (by no means certain) that they would know the quote's source. They would otherwise certainly assume the quote original to Sol-Fed. (honest question) are you just annoyed a group that you're not part of has used bits of your text? Don't flatter yourselves... I'm annoyed at groups repeatedly putting their name to others' writing without acknowledgement or citation for self promotional purposes. It not about personal 'ownership' or authorship - I never put my name to things anyway - it's about how groups (often arrogantly) handle the work of others for their own ends. It really is common practice to directly cite the source article - which means more than 'it might be from somewhere within these 15 or so articles on this link'. Partial though the victory is, and with all the limits and weakness it contained, the struggle is highly significant. The ex-workers have achieved more than might have been expected (particularly after Enfield ended their occupation, and despite the absence of solidarity action by other car workers). Despite the pensions uncertainty, under present conditions and compared to most UK labour disputes of the last 25 years it is a pretty good result; and it sends a much more encouraging signal to workers who will face similar situations. So you haven't "used your analysis as it's spot on" - you've only used what fits your political line and so again I find the practice to be "plagiarise without acknowledgement and, worse, misinterpret your points and/or associate them with views you don't agree with". Therefore you should at least give a direct source to the article (which would occupy approx half a line in the precious A5) to give readers the option of an alternative assessment - especially if it's all so "spot on". ok, i've changed 'pathetic' to 'partial'. it's very difficult to condense an 8,000 word analysis into 400 words; it's not a politcal edit, if anything the appeal of your analysis is it doesn't fall into the ICC-esque trap denouncing everything involving unions, without skimping on criticism either. right, so in order to "use a quote as a quote" you'd tend to enclose it and quote marks and attribute it to the author ('a supporter'). like i said. i fully understand proper referencing, but i've never, ever seen a leaflet with footnotes. to be honest i'm not sure if the same rules apply to communist leaflets as academic or magazine articles etc. if a group wanted to adapt one of the many things I or Brighton SolFed had written - which i know has happened on several occasions - i think that's fair enough. it's far easier to get decent propaganda out there without duplicating when stuff's already been written. attribution is definitely nice, but personally i'm not bothered if its in this kind of context (condensed by 95% into a free leaflet) rather than passed off as original analysis by the author in a magazine article or something. as i've met you a couple of times, i probably should have emailed you to say what we were doing out of courtesy though, fair enough. the intention is not to pass off other peoples' views as our own and thus look clever, but to get decent analysis out to workers in struggle and encourage them to read more. i've changed the print version to read "this leaflet is compiled by Brighton Solidarity Federation from original sources on libcom.org found in the links provided", and added footnotes into the version above. No. As general principle, use a quote as a quote and directly cite the original source article. Simple and common behaviour. To continue this is pedantry, but also clarification, as you still haven't quite got it; the two above quotes don't mean the same thing. A citation is, for you, to merely give an author's name or title - but what I mean by citation is to cite the original source text of the "quote". Quite different. I enjoyed the article thanks. I really liked this. There should be an updated version. There's been a similar text written, think it's still a draft but it looked good to me. I'll ask and try get it on here! cool...it'd be of interest (well, to me at least).